Part I: What Is Anthropology? Chapter 1: Human Beings and Being Human: An Overview of Anthropology. Chapter 2: Looking Into Humanity’s Mirror: Anthropology’s History. Chapter 3: Actually, Four Mirrors: How Anthropology Is Studied. Part II: Physical Anthropology and Archaeology. Chapter 4: The Wildest Family Reunion: Meet the Primates. Chapter 5: My Career Is in Ruins: How Anthropologists Learn about the Past. Chapter 6: Bones of Contention: The Fossil Evidence for Early Human Evolution. Chapter 7: It’s Good to Be Home: Homo sapiens sapiens, Our Biological Species. Chapter 8: Hunting, Fishing, Sailing, and Sledding: The Spread of Humanity Worldwide. Chapter 9: Old, Old McDonald: The Origins of Farming. Chapter 10: The Development of Civilization. Part III: Cultural Anthropology and Linguistics. Chapter 11: The Spice of Life: Human Culture. Chapter 12: From Kalahari to Minneapolis: How Cultural Anthropologists Work. Chapter 13: Can We Talk? Communication, Symbols, and Language. Chapter 14: Types of Types: Race and Ethnicity. Chapter 15: Guess Who’s Coming to Dinner? Identity, Family, Kinship, and Gender. Chapter 16: Not at the Dinner Table! Religion and Politics. Part IV: So What? Anthropology, the Modern World, and You. Chapter 17: Kiss or Kill? Diversity, Conflict, and Culture. Chapter 18: Looming Disasters? From Overpopulation to Space Debris. Chapter 19: Eve and the Iceman: The Cutting Edge of Physical Anthropology. Chapter 20: Stonehenge and You: Why Archaeology Matters. Chapter 21: Ten Things to Remember about Anthropology, Whatever Else You Forget. 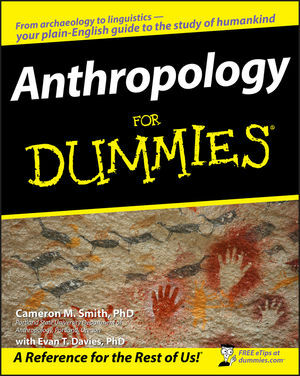 Chapter 22: Ten Great Careers for Anthropology Majors. Chapter 23: Ten Great Anthropologically Themed Movies and Books.